Dan Rice Days Festival - Who is Dan Rice? 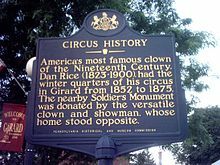 Dan Rice was an established circus owner long before making Girard his home. Born in 1823, he grew up on the Mulberry Street of a New York City's Manhattan District in the home of his loving mother, just doors from his paternal grandfather,a prominient lawyer and landowner. His mother and father's marriage was annulled, but Dan remained in contact with both parents even after his mother remarried. At age thirteen Dan was employed by his Stepfather to deliver a horse to Pittsburgh. Traveling through the state of New York to Buffalo, then south to Pittsburgh, Dan found work as a stable boy and sometime jockey. Falling in love with the city, he made Pittsburgh his new home. At 17, he married his first wife, Maggie, and shortly thereafter gained his first exposure as a performer while exhibiting a trained pig with a traveling show. Dan joined a full-fledged circus at age 20, and along with Maggie traveled the country with various troupes, all the while learning and honing his craft. He proved a natural at performing, rapidly rising through the ranks to become one of the circus world's most popular acts, and by 1848 became owner of his first circus company. Small in stature, Dan was a charismatic and charming performer. Quick-witted and possessing a powerful baritone voice, the multi-talented Rice was successful at all aspects of his trade. A gifted animal trainer, singer, dancer, speaker, and comedian, Dan had an uncanny ability to draw in audiences, immediately establishing a personal connection with them by knowing and discussing precisely what was on the public's mind at the time. By 1852, Dan and Maggie, now the parents of two daughters named Libbie and Kate, settled in New Orleans where Dan managed the popular, lucrative circus company known as "Dan Rice's Great Hippodrome and Menagerie." Business was booming and with a profit of nearly $1000 a week, Dan was one of the highest paid performers in the nation. A year later, Dan brought his "Great Show" to Girard for the first time. 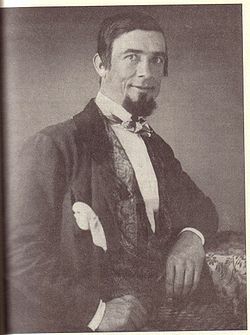 Looking to expand his appeal to the northern United States, Dan took the advice of friend and former colleague Agrippa Martin and bought several tracts of land in Girard as a winter headquarters for the circus. Martin, who had worked for Rice as an animal trainer, now lived in Girard and operated a hotel on Main Street. Dan agreed with his friend that Girard was in an ideal location. Route 20, the major coast-to-coast thoroughfare of the time, ran directly through Girard and intersected with the newly built Erie Canal Extension which ran north to south, providing easy access from all directions. As Girard was largely unsettled, plenty of land was available for barns and other structures to accommodate the large number of circus animals and workers. Unfortunately, many of the 600 residents of Girard were unhappy with the prospect of hosting a circus troupe every winter. The town was a close-knit community and wary of outsiders, especially those whom they considered to be low on the social ladder, even though Dan came from a prominient family in New York City. Circus performers, regardless of their level of wealth and fame, were generally looked down upon as "riff-raff" and not suitable to share a community with proper folks. For the next several years, Dan Rice's Great Show arrived in Girard via canal boats every October. Zebras, giraffes, monkeys, and polar bears paraded down Main Street, followed by a special performance exclusively for the people of Girard before the animals were settled in for the winter. During the long snowy months, Dan and his crew used their down time to achieve some of the most remarkable training feats ever seen in America. In the unique round barns built specifically for training purposes, Rice and his assistants taught an elephant to walk a tightrope, and also produced an astonishing act featuring the first trained rhinoceros in the United States. Overall, Rice's years in Girard were happy and prosperous ones, despite an amicable divorce from his wife Maggie in 1860. Dan did his best to stifle his tendency toward heavy drinking and occasional brawling, and by now the majority of townspeople had accepted him and his troupe, even looking forward to the excitement and additional income generated by the circus's yearly visits. Enter Rebecca McConnell. Rebecca was the only child of Henry and Charlotte McConnell, wealthy business owners and one of the founding families of the Girard community. The McConnells had carefully raised their beautiful daughter to follow in their footsteps as a member of the elite local society, and were hesitant with regards to Rebecca's attraction to the worldly Dan Rice. Having been introduced by Rebecca's grandfather, the two waited until Rebecca came of age and were married on November 4, 1861, Rebecca's eighteenth birthday, Dan was 38. "I am in love up to my eyes," Dan Rice wrote a friend in 1861, referring to his new bride. After their honeymoon, Rebecca remained at home in Girard while Dan resumed touring. Just over a year later, the couple welcomed their first child, a daughter named Lottie. Tragically, the child died of a respiratory illness at the age of six months. Rebecca reacted to her baby's death by immersing herself in a completely foreign experience-she joined her husband and immersed herself in his business, the circus, despite her family's objections. During this time, as occurred off and on throughout his career, Rice's finances dwindled. He was reportedly generous to a fault, and despite his many talents was a poor businessman. In fact, Rice built and lost three fortunes during his lifetime. Ever focused on the present moment, Dan donated or loaned money to whoever needed it at the time, regardless of his own financial situation. Controversy over the impending Civil War also contributed to Dan's troubles in the early years of his marriage to Rebecca. As he performed in both the North and the South, questions about which side of the conflict he was loyal to constantly arose. Some of his detractors even labeled him a spy, and many wondered aloud if his marriage to Rebecca was merely a ploy to make himself appear more sympathetic to the Northern cause. Being a performer with a business to protect, Dan may have fueled the controversy by never taking a definite position on either side, a natural reaction for someone whose livelihood depended on essentially pleasing everyone. After the war was over, Dan provided financial assistance to the needy in both the North and the South, helping to rebuild Southern churches and schools while at the same time supporting the widows and children of Northern troops who had been killed in the conflict. Rice's most lasting legacy to the people of Girard was the erection of the marble monument that still stands in the middle of the town's Main Street. Cynics, perhaps still smarting over Dan's unpopular marriage to Rebecca, objected to the placement of the monument which at the time was directly in front of the Rice mansion, implying that the monument was really intended to glorify Rice himself. In the end, those who welcomed Rice and the attention he brought to the tiny village prevailed, and the monument went up. Leonard Volk of Chicago, famous for sculpting one of the two life masks of Abraham Lincoln, was comission to sculpt the 27 foot tall pillar. While most monuments being built at this time were obelisks, the artist chose a pillar to signify the "strength" that was demonstrated by the Girard community during the troublesome American Civil War. An eagle sits atop of the monument clutching in its talons a draped American flag. The artist sculpted him looking towards the Northwest, gazing upon Chicago, his home. At the time of sculpting, the American flag carried 35 stars, the 35th being added in 1863 for the creation of West Virginia. Leonard Volk, chose to sculpt the draped flag so that only 24 stars showed, representing those states that remained in the Union during that terrible conflict. The base of the monument is supported by 4 sculpted cannons, a symbol which pays tribute to the members of the Union Artillery which fought in the war. The other branches of services are also honored on this memorial through symbols: an anchor representing the Navy, crossed swords representing the Cavalary, and crossed rifles representing the Infantry. On the north side of the monument an inscription reads: "In memory of the OFFICERS and SOLDIERS from Erie County, Penn who have died in defense of their country." On the South side an inscription reads: "Erected by Dan Rice inaugurated Nov 1 1865"
The monument was shipped to Girard at Rice's expense and dedicated at an elaborate ceremony on November 1, 1865. The dedication was covered nationally by Harper's Weekly, and drew a crowd of approximately 10,000 people. Three years later, the Rices became parents again, this time to a boy, Dan Rice, Jr., the same year that Dan ran in an unsuccessful race for the Presidency. In 1870, Rebecca returned briefly to the circus, however the two were beginning to drift apart as Dan spent more and more time touring while Rebecca remained with her family in Girard. By 1881, Dan and Rebecca divorced, and Dan no longer visited Girard. His fortunes continued to diminish, and he died virtually penniless in 1900 at the age of 77. Rebecca, suffering from a variety of health problems, had passed away five years earlier. The couple's son, Dan Rice, Jr., moved his family west and never returned to Girard, although his ancesters did return to settle in Erie, Fairview and Millcreek.